This study guide is for each participant. Each study includes an introductory discussion question, 10-12 questions on the Bible passage and a closing suggestion for prayer. Each study includes a word list explaining any difficult words from the Bible passage. 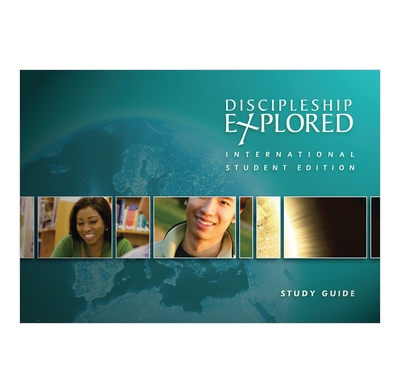 Discipleship Explored International Student study guide is for anyone who wants to make the most of their Christian lives, but especially for those people who have recently completed an evangelistic course, such as Christianity Explored, and decided to follow Christ. How do you equip international students to live as Christians when they return home? We are convinced that the best possible preparation for returning home is good discipleship. The International Student Study Guide features a series of Bible studies through Philippians which can be used on their own, or in conjunction with the Discipleship Explored DVD. The studies are designed to be accessible to people from different cultural backgrounds with a special emphasis on clear and simple English. The materials are ideal for those with English as a second language and can be used with language students, undergraduate and postgraduates. The studies aim to to teach international students to read the Bible for themselves and to live as Christians both here and back home. And while it is designed for new Christians, it can also make a great first term’s Bible study for newly arrived Christians. The International Student Edition Study Guide should be used in conjunction with the Universal Edition Leader's Guide.